A personal service to digitise, save, protect, declutter and enjoy your precious family memories. All your precious video, photos and audio media is handled with extreme care, respect and with total privacy at all times. Video services, photo services and audio services. We digitise precious family videos, photo and audio memories. To save, protect and enjoy your personal media, we install media systems. We also provide video production and editing services and personalised DVD gifts. We serve Surrey, Berkshire, Hampshire, London and beyond. Video services including VHS to DVD, VHS to mp4, cine to DVD, cine to mp4, video to DVD, video to mp4. Photos to jpeg, slides to jpeg, negatives to jpeg. Digitise, scan, convert, transfer your video, cine film, photos, negatives, slides, photograph albums, audio or music onto DVD, digital files (e.g. JPEG, wav, mp3, MPEG2, mp4 etc.) onto memory stick, hard disc drive or Network drives. We can digitise, convert or scan: VHS, VHS-C, S-VHS, S-VHS-C, Video8, Hi8, Digital8, DV, HDV, MicroMV, Cine standard8, cine Super8, 16mm, photos, negatives, 35mm slides, audio cassette, micro cassette, mini cassette, reel to reel audio tape, open reels, vinyl records and more – for details and pricing click here. The pricing to digitise is here and we can then send you your digital files over the internet for free. If you would like your files on a storage media or device (e.g. DVD, USB memory stick etc) the pricing for this is also here. 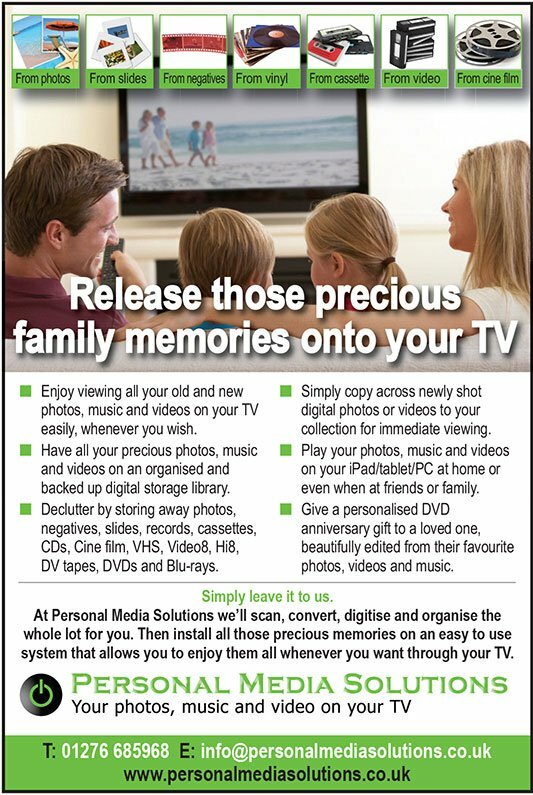 Supply, install and demonstrate easy to use personal media systems so you can enjoy your video, photos, audio and music on your TV, Home Cinema System, iPad or PC at home or when at family/friends. For details click here. Video services, film your corporate event, family event, sports or other activity in 4k Ultra HD and provide you with edited DVD, Blu-ray or video files. For details click here. Your photos, video, audio or music are carefully edited into a personalised DVD. So that you can give a unique personalised gift for Birthdays, Christmas, special occasions. For details and pricing click here. Based in Camberley, Surrey, we serve Surrey, Hampshire, Berkshire, London, Oxfordshire, Buckinghamshire, Hertfordshire, Essex, Kent, Sussex, Wiltshire and other areas. This includes Camberley, Sandhurst, Crowthorne, Farnborough, Aldershot, Farnham, Fleet, Woking, Guildford, Bracknell, Wokingham, Lightwater, Ascot, Windlesham, Sunningdale, Virginia Water, Wentworth, Chobham, Windsor, Egham, Chertsey, Weybridge, Staines, Sunbury, Walton-on-Thames, Epsom, Leatherhead, Cobham, Chessington, Twickenham, Richmond, Basingstoke, Reading, Maidenhead, Slough and West London. Personal Media Solutions was started in 2009 by Martin Wallman. He has 35 years experience in Photography, Videography, Consumer Electronics, IT and Technology. He saw the need for simpler solutions to enjoy precious family photos, music and video memories in the home environment. Technical advances and the convergence of consumer and computer based media solutions, mean that a personal service can be flexible, affordable and easy to use.